Is Gen Z elbowing the Millennial generation aside as the demographic most sought after by marketers? That’s up for debate. However, Gen Z and its massive size—2.6 billion by 2020—and annual buying power—$44 billion—are clearly a soon-to-be in demand audience for marketers of every stripe. Generation Z, born just after Millennials between 1996 and 2010, is the first generation to have never spent a single day without the Internet. The Gen Z cohort is said to have an average attention span of a mere eight seconds. 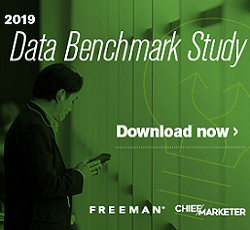 And this group’s age range—spanning from eight to 22—is wildly different from one end to the other, forcing marketers to refine the demographic into smaller groups based on lifestyle interests, purchase behavior and spending power, among other criteria. So what does it take to make a mark on Gen Z? Content and messages that are fine tuned for speedy viral sharing and carefully selected influencers are often part of the marketing strategy. These key ingredients play a particularly important role as Gen Z, in fact, believes that brands aren’t interested in communicating with them. 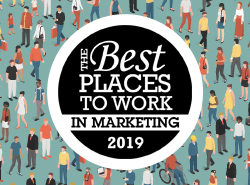 Smart partnerships, interactive games, social media contests and STEM competitions are also key strategies that are making authentic connections with this demographic. Here, we break down four campaigns that are making the Gen Z connection. CHALLENGE: Get Dub Nation—a.k.a. Golden State Warriors basketball fans—excited about the new Under Armour Curry 4 “More Dubs” colorway sneakers. SOLUTION: Use a digital scavenger hunt (driven by the use of #DroneDrop) to get fans buzzing and scrambling to get their hands on the new kicks. One of the lucky fans who got a autographed pair of Curry 4 More Dubs. 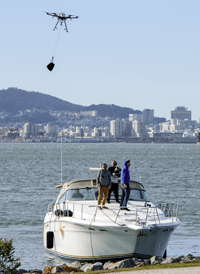 EXECUTION: The brand launched drones off boats to drop Stephen Curry autographed pairs of sneakers at locations across San Francisco and Oakland. Fans were invited to participate in the digital scavenger hunt on Under Armour Basketball’s Instagram page to find drop zone pins. Using an interactive map of the Bay Area, players were challenged to zoom and pan around looking for hidden drop sites. Upon receiving a unique QR code, they were directed to the hidden drop zones, where autographed pairs of the Curry 4 “More Dubs” colorway were delivered via drone. 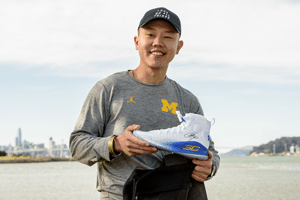 RESULTS: The activation not only drove hype among Warriors and Curry fans in the Bay Area but also drew the participation of visitors from more than 150 countries racing to obtain just 30 pairs of kicks. In just 14 hours, beginning on Dec. 16, the brand saw more than 500,000 map views and captured entries and email addresses from over 25,000 people. Fans averaged over eight minutes exploring the map and those who located the basketball mini-game spent an average of more than 10 minutes playing it. The Curry 4 sneakers are Under Armour’s best selling sneaker of the series to-date. The Claw Crane Game in action. CHALLENGE: Vera Bradley, designer of women’s handbags, luggage and travel items, has a solid following among young girls, teens and moms. But there is a disconnect when it comes to college students. SOLUTION: As high schoolers transition to college, Vera Bradley wanted to be there to show that its product line goes way beyond the items they liked to carry in high school. 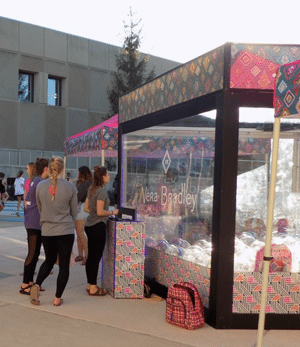 The strategy was to engage college students with a fun, interactive game and event to showcase new Vera Bradley products designed for that target audience. EXECUTION: Last fall, the brand traveled across the country from Arizona to Ohio targeting some of the largest universities in the country—Arizona State University, Indiana University, Michigan State University, Ohio State University—to engage with students as they began the fall semester. The focal point of the tour stops: The Claw Crane Game. 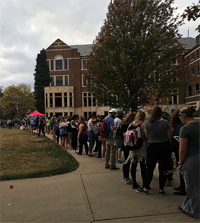 It didn’t take long for students to line up—two hour long lines were standard—for a chance to “claw” lunch bags and backpacks styled in Vera Bradley’s signature bold prints and solids. Student and brand ambassadors worked the lines chatting with students about their current products and Vera Bradley’s products to gather insights and feedback. Lines often grew long for a chance at a Vera Bradley giveaway. At Ohio State University, the game was merged with the excitement of the Homecoming Parade, which thousands of students attended. The events were covered through Snapchat takeovers. To build Instagram followers, students who shared a snapshot of their style with Vera Bradley on Instagram using the hashtag #verabradley were surprised to see it shared on Vera Bradley’s site. RESULTS: All told, 1,100 students played the game for a total 19 hours with 1,200 products given away. The program earned 7,500 walk by impressions and 1.6 million social impressions. Students taking on the challenge. EXECUTION: FedEx is an annual sponsor of the FIRST Robotics Competition, an international high school robotics competition that gives students real-world engineering experience. The challenge is a two-day, social media based competition consisting of math and science problems, scavenger hunt activities and other interactive components. Teams across the country participate by taking on STEM questions, riddles and photo assignments and posting their responses on social media for a chance to win grants and tech prizes. RESULTS: More than 1,700 qualifying entries, 65,000 Instagram posts and 35,000 Twitter posts were recorded. #FedEx trended during the event. Editor’s Note: This campaign won a 2017 Silver Experience Design & Technology Award from Event Marketer. CHALLENGE: Encourage consumers to purchase LittleBits Droid Inventor Kits and engage with the brand in a fun and creative way that leveraged the brand’s partnership with Disney/Lucas Films. The goal is to get kids interested in STEM and invention from a young age, making science, technology, engineering, art, and math applicable to their lives through Droid-building, and help start an inventor movement. SOLUTION: Engage Gen Z with a custom invention contest. 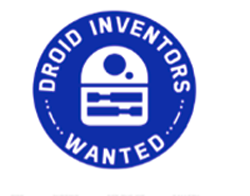 The Droid Inventor Kit offered fans an opportunity to create a custom Droid for a chance to win epic prizes. EXECUTION: Various media drove consumers to the microsite or mobile optimized site where they were encouraged to register and upload a photo of a unique droid that they built utilizing LittleBits Droid Inventor Kit and other LittleBits kits and craft products. Participants entered in one of two categories: “Padawan Learner” or “Jedi Master.” The winners were judged based on three criteria: inventiveness, creative use of materials, and video presentation. The celebrity judging panel included: Daisy Ridley, “Rey” in the Star Wars films; Kathleen Kennedy, President of Lucasfilms; Kelly Marie Tran, “Rose Tico” in “Star Wars: The Last Jedi”; and Ayah Bdeir, Founder & CEO, littleBits. RESULTS: 320 submissions, more than 70,000 visitors to the competition website with an average time spent of seven minutes, 33 seconds. Six winners, one sweepstakes prize, five honorable mentions.